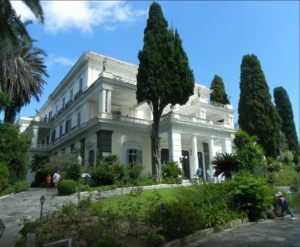 Located in the village of Gastouri, around 10km south of Corfu Town, Achillion Palace was built in the 1890s as a summer residence for Empress Elizabeth of Austria (better known as Princess Sissi). Constructed to a light, airy neo-classical design by the Italian architect Raffaele Caritto, Achillion was Sissi’s escape from oppressive court life of Austria and personal tragedy after the death of her son. Captivated by the Greek mythology, Sissi named the palace after the hero of the Trojan War, Achilles and filled it with artworks celebrating her favourite mythical hero but also numerous other characters from Greek mythology and history. The impressive gardens surrounding the palace offer stunning views both of the Corfu countryside and the Ionian Sea. The two largest and most important statues here are “Achilles dying”, pulling the arrow from his heel, and “Achilles triumphant”, standing at over 11 meters from its base to the tip of his sword. The garden also features statues of other significant Greek philosophers and poets as well as the Peristyle of the Muses, a courtyard surrounded by columns featuring the Nine Greek Muses: Urania, for example, the Muse of astronomy, holding a globe or Terpsichore, the Muse of dance, playing her lyre.